The Constituent Relations Committee (CRC) awarded The Society of Physician Assistants in Otorhinolaryngology/Head & Neck Surgery (SPAO-HNS) the 2010 AAPA Constituent Organization Award of Achievement in the Specialty Organization category. 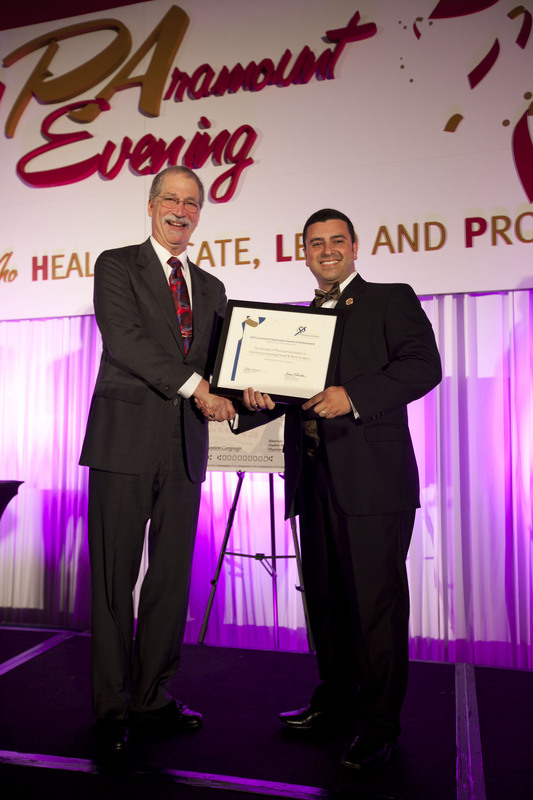 Jose Mercado accepted the award on behalf of SPAO-HNS on May 31, 2010 during the PA Foundation's award dinner. The purpose of this prestigious award is to recognize AAPA constituent organizations that have developed and successfully executed projects that have had a positive impact on healthcare and/or the PA profession and have encouraged leadership and organization growth. SPAO received this award for their pioneering efforts in collaborating on-line CME programs with parent specialty organization American Academy of Otolaryngology/Head & Neck Surgery Foundation (AAO-HNS). The COOL site provides ENT specific CME to Physician Assistants and Physician Assistant Students. SPAO-HNS was also recognized for their innovated use of on-line technology to facilitate leadership development with the Leadership Continuity Website which gives all SPAO members access to important organization documents and leadership tools. Constituent organizations are independent organizations that are officially chartered or recognized by AAPA. At the time of the award, there were 24 recognized organizations composed of individuals working within a specific medical or surgical specialty. Currently there are 56 chartered chapters representing all 50 states, the District of Columbia, and five federal services. Caucuses are recognized organizations composed of individuals sharing a common goal or interest related to health care access or delivery. The mission of the Constituent Relations Committee (CRC) is to strengthen AAPA through its officially recognized constituent organization - chapters, specialty organizations, caucuses, and congress - to enhance and advance constituent organization development, and to serve as a resource to members and leaders. CRC represents constituent organizations and focuses on the inclusiveness of all AAPA constituent organizations. CRC is composed of: five regional representatives (Northeast, Southeast, North Central, South Central and West), a specialty organization representative, a caucus representative, and a representative from the Student Academy of AAPA (SAAAPA).